Sweet and juicy, tree ripened cherries for pickup only. 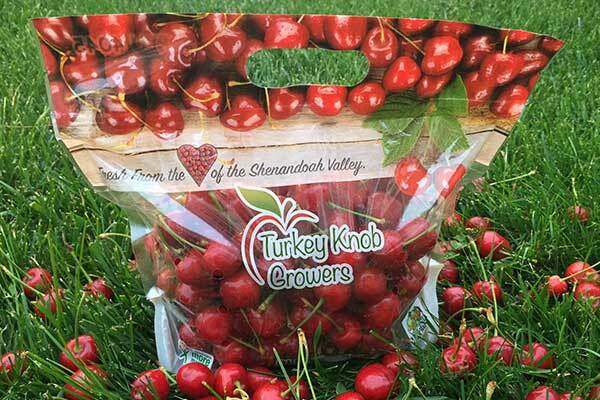 This year, Turkey Knob Apples is trying a new setup to bring you delicious sweet cherries. We will be offering orders thru our website which will be available for pick-up only at our Timberville Fruit Market during designated times. I am pretty sure I want cherries but I am not positive. Can you just “hold” a couple of bags for me without payment? Unfortunately, we are not able to hold fruit without payment thru our website. What if I forget to pick up my fruit on my designated pickup date? We are unable to refund money for forgotten orders. Refunds can be made if you communicate your cancellation at least 24 hours before your pickup time. Something came up and I need to cancel my order. That’s okay; we understand. To cancel your order, you must contact us at least 24 hours before your scheduled pickup date. Just email us with your name and order number from your confirmation email. We will refund your money and sell the fruit to someone else. I can’t make it to the Fruit Market on my scheduled pickup date. May I send someone else to pick up the fruit? Please feel free to send a friend with your printed confirmation email to pick up your fruit. You may place your order up to one week in advance and as late as 10:00 a.m. on the date of the scheduled pickup. Orders may be picked up between 3:00 p.m. – 5:30 p.m. Monday to Friday. We are at the mercy of Mother Nature and on occasions there are weather related issues. If so, we will provide a full refund or contact you about another date option.